The father and son team at Coleman & Coleman Advanced Dentistry are committed to providing patients with a superior experience from start to finish. To this end, the founders of the San Diego dental practice recently collaborated with Rosemont Media and their crew of writers, designers, and developers to produce a state-of-the-art responsive website design featuring an attractive layout, original content, and an easily navigable interface. The result is an aesthetically pleasing and informative resource that both existing and potential patients can utilize to enhance their oral health and to achieve their cosmetic dentistry goals. In addition to the adaptable format, which allows users to browse the website from Internet-compatible mobile devices without having to pan and zoom to view the full content, the practice site also offers numerous other benefits, including customized landing pages, a convenient footer map with practice information, and one-click connectivity through the navigation bar. From these drop down menus, individuals can learn more about porcelain veneers, Invisalign®, teeth whitening and other popular general, restorative, and cosmetic dentistry procedures. As an increasing number of patients perform research on the go, the upgraded site offers unfettered accessibility for users visiting from smartphones, tablets, and laptops. To help Coleman & Coleman Advanced Dentistry maintain a high level of visibility in its online marketplace, Rosemont Media also equipped the website with the latest dental SEO strategies, which can help the site rank highly on major search engines, including Google, Yahoo, and Bing. The combination of advanced design elements, optimized content, and mobile-friendly layout provide an exceptional user experience and aligns with practice’s patient-centered philosophy. 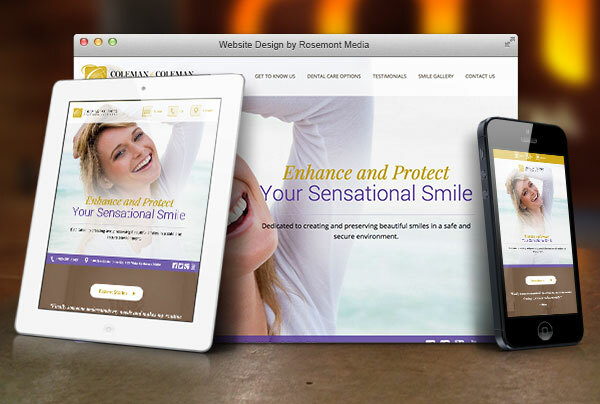 Interested in Rosemont Media’s customized dental websites? View an example of our innovative designs at sandiegocosmeticdental.com.